Writing and gaming generators since 2186. Chaotic Shiny is a generator site aimed at people who write, game, or live in fantasy worlds of their own creation. Grappling with writer's block? Need a character on the fly? Party just walked into a tavern and you want it to be a little more exciting than normal? Want to flesh out a setting with some detailed religions? Chaotic Shiny is the site for you. Generators are divided into rough categories based on what they come up with. Some of them, such as the drink and name generators, are simple, whereas others, such as the civilization and pantheon gens, are much more detailed. If you want a generator that you can't find here, you can make your own with the custom gen builder, or feel free to drop me a line with suggestions or feedback. Sign up for the newsletter to be the second (I'll be the first) to know about new generators, website changes, product updates, and free stuff. If you sign up now, you'll get Trader Tables and Terror Tables, .pdfs full of dice tables in the style of Tavern Tables. You'll also get the Sijara chapter from Martial Flavor for free! 3/31/19: This is not an early April Fools' joke: there is a new generator! The Small Inventory Generator generates the kind of item inventory that you might find on a peasant, guard, merchant, or other ordinary NPC that the party is searching. No blatantly magical artifacts or enchanted weapons. Just everyday items, some of them more potentially suspicious than others. 10/30/18: Gearing up for NaNoWriMo? You can get a 50% discount on the Writer Tools Generator Pack with the discount code "Writer2018" over at the Chaotic Shiny Productions store. Check out some of the other generator packs while you're there! 7/28/17: I'm aware of the issues with the PHP-based generators (the ones with dropdown menus) and I'm working on a fix. Thanks to everyone to let me know! Update: All fixed! My host upgraded my version of PHP without telling me and some of my code didn't work in the new version. Everything should be fixed now. 11/16/16: Real life continues to interfere, but I haven't forgotten you! If you ever wanted to try out one of the paid generator packs, now is the time! For one week only, they're on sale for 99 cents each. Just use the code "NaNo2016" in your cart. It works on any generator pack in the store. 10/30/15: I'm not dead! I know it's been nearly a year, but I haven't abandoned the site! I've just had a lot of life stuff going on and I've been spending a lot of time on my leatherwork. But I have something new for all of you! A free standalone Character Generator that has a character portrait and a brief description of a variety of medieval fantasy characters. Happy NaNo! 10/31/14: Happy Halloween! No new generator today, but the new NaNoWriMo Calendar is out, helping you stay on track with your word count with options like "no writing on weeekends." It's now more flexible than ever, keeping you on track not just for this November but for any month in the future! Also, there's a sale over at Chaotic Shiny Productions in honor of NaNoWriMo: until the end of November, use the code NaNo2014 to get 50% off any orders of two or more products. It's like buy-one-get-one-free but with an extra 50% off for everything else! If there's any generator packs you've been thinking about trying out, now's the time. 7/14/14: Whew! It's been a while, hasn't it? I haven't died, and I have made an Armor Generator to round out your weapon-laden treasure hoards. As for where I went, the newsletter subscribers got the long answer. The short answer is that I have a full time job and a lot going on and while I have no plans to let the site die, I doubt I will be able to update it quite as often as I used to. So don't despair; I plan on more generators. Just probably not every two weeks the way I used to be able to. Oh, and I also make leather armor now, which is taking up a bit of time. In unrelated but also time-consuming news, the Tavern Cards from my Kickstarter are publicly available! The backers all seemed to like them. Generate a tavern complete with random events and colorful NPCs, and then use the cards to play poker while you're there. 11/15/13: By request, the Noble Generator gives you noble names and titles and occasionally epithets. Also, wow, we're halfway through NaNoWriMo! Do you know what that means? It means the "halfway through NaNo half off" sale at Chaotic Shiny Productions! Use the discount code NaNo2013CB to get 50% off the Character Builder Generator Pack, and NaNo2013WT to get 50% off Writer Tools. The best time to buy generators is before the start of NaNo, but the second-best time is now. And since I love NaNo so much, this year I'm also offering a special prize to people who finish! This will only be available via the newsletter, though, so you'd better sign up before the end of NaNo if you want to be eligible. 7/12/13: It's been a while, huh? Don't worry - I haven't vanished, and I have a whole bunch of new stuff for you! First off, the Attitude Generator helps you instantly determine how NPCs feel about the characters. The Magic Pack is a combination of some of the most popular magic-related generators, and last but not least, the Face Generator is a free graphical generator that generates, well, faces. 3/17/13: The KickStarter kept me very busy, but that doesn't mean I've forgotten about making generators. Enjoy the deeply silly Fallacy Generator! And if you want something a little less silly, my card-deck-related travels for the KickStarter also led to the creation of the Rune Cards, a deck of playing cards that helps you learn the runes (and looks cool). 1/17/13: Chaotic Shiny is running its first KickStarter! Tavern Cards are a gorgeous full-color deck version of the venerable and popular Tavern Generator. Use them to randomly generate a tavern - complete with name and patrons - or just use them to play poker. There's even quite a few cards that make good NPC portraits. It won't be running long, so go check it out and grab a deck while you can! 11/16/12: There's a new freebie up on Chaotic Shiny Productions, the Random Compass. For times when you want to know where the noise is coming from, which way the thief ran, or where the nearest town is. 10/13/12: A bit of a wait, but I hope it's worth it, as I have three exciting things to announce. First, the Random3 Encounter Contest is over and you can see all the entries here! Congrats to the winners and thanks to all who entered. Second, the long-awaited Writer Tools Generator Pack is now available over at Chaotic Shiny Productions! Whether you're stuck in a rut, looking for inspiration, in need of motivation, or just want to have some fun, Writer Tools has something for you. And last but not least, a new very silly generator, the Political Buzzword Generator / Indy Band Namer. Enjoy! 8/18/12: Two exciting updates for the Random3 Encounter Contest! One, due to popular request there is now an option for writers: use three random generators to inspire a short vignette, and send that in as your entry. Two, we now have awesome sponsors! In addition to free stuff from Chaotic Shiny Productions, you also have the chance of winning gift cards or a free canvas from Banners on the Cheap (and check out their new RPG maps category), or some very cool mini accessories courtesy of Stuffer Shack, whose fantastic blog you should check out while you're there. So what are you waiting for? Check out the sponsors, then enter the contest! 8/5/12: At long last, Chaotic Shiny's 100th generator is released: the deeply silly RPG Drinking Game Generator. And in celebration of hitting 100 generators, the Random3 Encounter Contest has begun! Create a random encounter using three random generators, send it in, win cool prizes. And as if that were not enough cool stuff, the RuneSpinner is the newest freebie over at Chaotic Shiny Production. Go check it out! 4/29/12: I missed a month, and so I'm making up for it with two new generators: the Rune Generator and the RPG Class Generator. Add some variety to your magical languages and fortune-telling, or get inspired for that new RPG you're working on. The RPG Class gen also works great for character concepts for point-buy systems that don't have classes to start with. Also, I should have done this long ago: Stuffer Shack, the incredibly awesome RPG Blog / place to buy really cool stuff, is now linked on the links page. Tourq has really cool steal-able blog stuff, actual physical products that can make your game better, as well as fun contests and lots of nifty links. Next time you're pining away waiting for me to create more generators, go there and read the blog. 2/25/12: One of the most-requested generators, the Meal Generator, finally exists. I wasn't sure I could do it without most of everything sounding disgusting, but it seems to have worked. And if anyone tries any of the recipes, let me know how it works out! There's also a free standalone version of the opinion gen available now over at Chaotic Shiny Productions if you want to get a taste of what the paid generator packs are like. 1/11/12: Adding to the small but growing collection of sci-fi gens is the Planet Generator. A mix of scientific terminology and descriptive phrases, it's helpful for whenever your ship has popped out of a wormhole into an unexplored system. There's also the free Problem Mini-Gen over at Chaotic Shiny Productions. It's a small standalone mini-generator. I've also changed the [Productions] link up to to say [Store] and link to the Store page upon realizing that most of you have no idea I sell things. 12/7/11: Hello everyone! Survive NaNo? Here's what's quite likely the last gen of this year: the Magical Component Generator. Also, go check out Chaotic Shiny Productions for something new and different. 10/28/11: It's almost that time of the year again! No, not Halloween; NaNoWriMo. I've updated the NaNo Motivator with some all new outcomes for this year, plus the Free NaNo Calendar App over at Chaotic Shiny Productions got a 2011 update. But that's not the most exciting news. Do you write stories or run games? Do those stories or games have characters in them? Then the Character Builder Generator Pack is for you. It generates characters, names, physical appearances, motives, opinions, family connections, and more. 9/24/11: Adding to the small but growing collection of modern generators, the Car Generator is a must for anyone with James Bond in their game. Also makes normal cars if for some reason that's useful to you. 9/10/11: The first new silly gen in a while, the Whitewolf Game Generator. Comes up with names in the form of "Noun the Something." 9/2/11: A very simple but powerful gen, the Motive Generator does just what it says. Generate overarching motives for characters, or just explain why they're up to their latest shenanigans. Meanwhile, over at Chaotic Shiny Productions, check out Arcane Cultures: Cailleath for free! If you like it, consider buying the newly released Arcane Cultures: the Valok. Both products are systemless - that's right, non-4e players are finally getting some .pdf love. Go check it out! 7/29/11: Announcing the Portal Contest. The rules are simple: Create a portal with the portal gen, then email it to me along with 1) a drawing of the portal, 2) a couple paragraphs of description / plot hooks / other shenanigans relating to the portal, or 3) both. Repeat as desired. Contest ends Aug 9. At the end of the contest I will randomly draw winners (the number depends on how many people enter) to receive a free City Builder Generator Pack. Multiple entries still only get you one entry in the drawing, as while I love encouraging creativity, I hate math. Depending on how many people enter, I might put together a free pdf of entries, so by entering you consent to having your work in that. Now go make some portals! P.S. You know who knew about this contest ahead of time? Newsletter subscribers. Just saying. 7/26/11: Introducing the Portal Generator, for all your plane-hopping, dark-ritual-preventing, dimension-shifting adventures. Also, there's a shiny new free thing over at Chaotic Shiny Productions. 7/22/11: I've got a new gen on the way, but while you're waiting go check out RanGen, a new generator site with some pretty cool gens. 6/29/11: A long wait than usual, but hopefully the new gen is worth it: the Holiday Generator! And check out Chaotic Shiny Productions for the newest genpack, the City Builder Generator Pack. The all-new Rumor Generator alone should be worth the price of the genpack. 4/23/11: For all those who got excited for all the wrong reasons when they heard about the magic gen comes the answer to their problem - the Magic Trick Generator. 3/17/11: Holy unexpected hiatus, Batman! What's going on? Well, a full time job and a full time social life. But fear not, a new generator at long last - the Magic Generator! It's something I've been wanting to do for a very long time, and I'm very happy with how it turned out. Meanwhile, over at Chaotic Shiny Productions, the similarly magical Arcane Flavor was just released! Go buy it. 2/19/11: There's an interview with me up at Game Knight Reviews if you want to hear a bit about what's behind the magic. And if you feel like I've dropped off the internet in the last month and a half - you're right! I feel like that too! But don't feel too abandoned; I have a bunch of cool stuff in the works, and the next generator should be done soon. 12/30/10: Happy New Year! As your present, here's two new generators: the much-suggested and long-awaited Prophecy Generator and the inspirational Cultural Mix Generator. Also added a new generator site to the Links page, The Writer's Square. 12/1/10: Happy Hannukah, and congrats to those who won NaNoWriMo! This generator is a bit late for this year, but might come in handy next year: the Inspiration Finder helps you find inspiration in the world around you. 10/28/10: There are two holidays in a row this week: Halloween, and the start of National Novel Writing Month. I've decided to help you celebrate both! Over at Chaotic Shiny Productions there's the Zombie Generator Portable which combines the zombie gen with randomly created zombie images - and it's free. For those of you doing NaNo there's the NaNo Calendar 2010 that calculates how many words you should write each day based on goal and system (equal every day, equal minus weekends, reward system, etc). And of course, the NaNoWriMo Motivator got its annual update with all-new motivation. Enjoy! 10/16/10: Another awesome suggestion from the Suggestion Contest, the Poem Generator is the flipside of the Writing Exercise gen. Generates topics, genres rhyme schemes, and more. Also, updated the Bazaar Generator based on some great suggestions - now allows for historical vs fantasy, multiple shop owners, and different shop types. 9/23/10: Based on a suggestion, the Weather Forecast Generator tells you what the weather's going to be like in the surrounding area for the next few days or weeks. Also, there's a survey going on over at Chaotic Shiny Productions about which generator packs people want to see next. Planning on buying a generator pack? Check out the survey. Also at Chaotic Shiny Productions, free stuff. 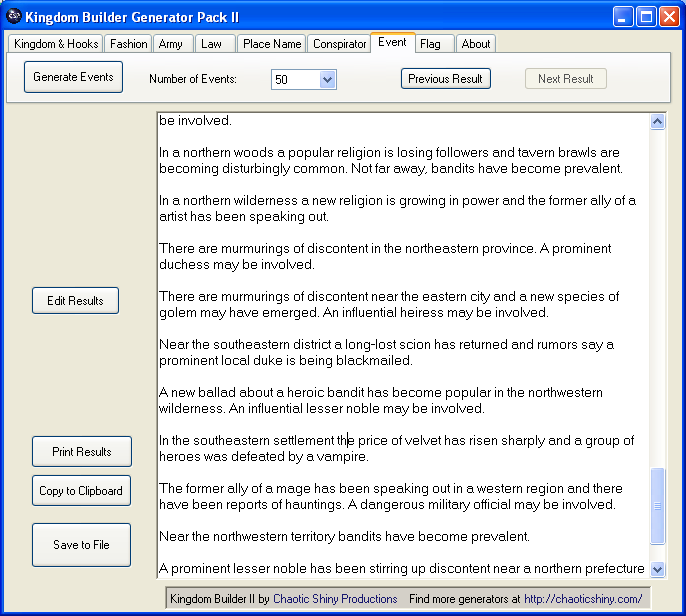 8/29/10: One of the many great suggestions from the Suggestions Contest, the Historical Event Generator is a distant cousin to the Event Generator in the just-released Kingdom Builder Generator Pack II. Comes up with dates for disasters, the rise and fall of individuals and buildings, surpluses and shortages, and more. 8/5/10: Not quite back to my usual two-gens-a-month schedule, but slowly clawing out enough free time to get back to it. Here's one of my most extensive generators yet: the Modern Name Gen uses name data compiled from the census. That's thousands of names, from the common to the rare. Also, check out the Suggestions Contest going on at Chaotic Shiny Productions right now! 7/6/10: Thanks to an awesome fan, Chaotic Shiny now has an official Facebook fan page! And to help kick it off, I'm donating a prize for its first contest: write a 55 word story based on inspiration from the Tarot gen. If you're on facebook, go check out the fan page, then enter the contest! And speaking of contests, I've added the Monster Contest and Paradox Recycler (newsletter only) contest compilations to the Misc Resources page. 6/26/10: Whew, that was a long break! I'm typing this now from sunny California, so you know my cross-country move was a success. I come back from my hiatus with an awesome new generator, the Tarot Card Generator. I've wanted to do a tarot gen for a long time, but never could quite get it right. I wanted one that blew all the other tarot gens out there out of the water. I think I succeeded - let me know if you agree. 5/9/10: A new silly generator, the Academic Field Generator comes up with disciplines like "Thaumaturgical Hydrocryptology," "Atypical Philosophy," and "Observational Archetypes." By the way, there may be a brief interruption in service (ie email answering and new generators) as I graduate college, move across the country and start a new job. 4/19/10: A much-requested gen, the Place Name Generator comes up with things like "Scaletorn Grasslands" and "Gravefire Heights" as well as nonsense names. I wonder what's going on in Meatshield Mire? Also, a new freebie for you over at Chaotic Shiny Productions to celebrate the release of the Treasure Hoard Generator Pack. Also also, you writerly types might want to enter Nevermet Press's Monster Mashup Contest. Write a 300-word description of the monster, win great prizes and the chance to see your name in print. Everyone who enters gets a coupon regardless, so why not give it a try? 4/10/10: Based on several suggestions, the Zoomorph Generator. Creates animal-human mixes like the ancient Egyptian gods or harpies and centaurs, plus even more exotic ones with parts from many animals. Create specific individuals or generic descriptions of entire species. By the way, there's a pretty cool mini-contest going on in the newsletter right now. You've missed your chance for this one if you haven't already signed up, but don't worry - I run mini-contests pretty regularly, so go ahead and sign up. Also check out the new freebie over at Chaotic Shiny Productions. 3/26/10: A fun new free standalone mini-generator, the Damager rolls dice for you, then describes your attack. It's a tiny .exe file (no installation required!) that should work wherever .NET does: Windows, and Macs and *nix boxes running emulators like Mono or Wine. Go check it out! 3/16/10: A little late for pi day, the Spaceship Generator gives you names, ID codes, and stats for space ships. Now you've got someplace to put all those spare parts. 2/25/10: I really don't have enough sci-fi generators, do I? Based on a suggestion, the Futuristic Spare Part Generator lets you tell the mechanic to repair the triple kith nucleus of the laser grappler, and make sure the ionic phase gauntlet is in full working order. And gods help you if the delta redundant binding in the secondary shielding grid fails you in the middle of a battle. 2/16/10: For all you art lovers and art looters, here's the Art Object Generator. Paintings, drawings, sculptures, and what have you. Decorate the duke's summer room, stock a dragon's horde, or figure out what's up for auction.